Growing a potato is fun, since you can practically watch it grow before your eyes. You can grow a sweet potato, a white potato or start both at the same time to learn the differences. You can keep a journal to monitor the progress of the potatoes. Sweet potatoes make a more visually appealing, fast-growing plant with an abundance of leaves and vines. You can even give the sweet potato plant as a gift. 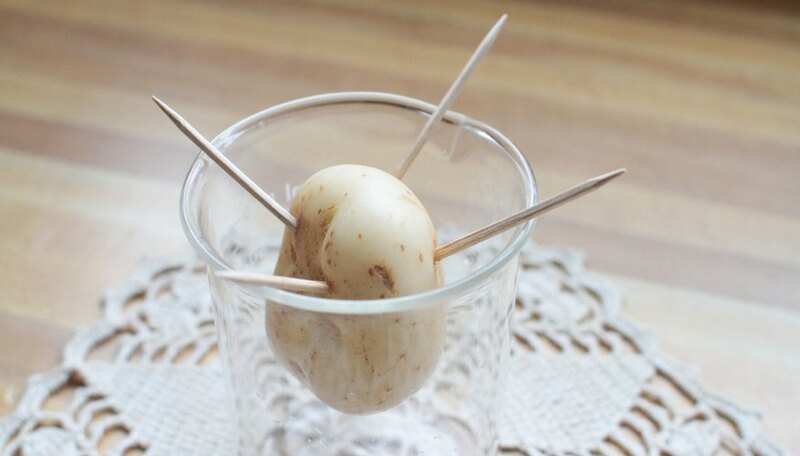 Stick four toothpicks into the sides of the white potato, arranging them so they stick out all around the middle. Insert the wide end of the potato into the clear plastic cup so the toothpicks rest on the rim of the cup. Add enough water to the cup to cover just the bottom of the potato. Place the cup with the water and potato in a dark, cool place. Leave it there for one to two weeks to allow the eyes and sprouts to grow. Put the white potato in the cup near a sunny window. You should see shoots and growing roots. Allow the potato to continue growing, adding water when needed, or transplant to soil when you like. Stick three to four toothpicks into the sweet potato. Insert the sweet potato into the glass jar. The toothpicks will hold the potato a few inches away from the bottom of the jar. 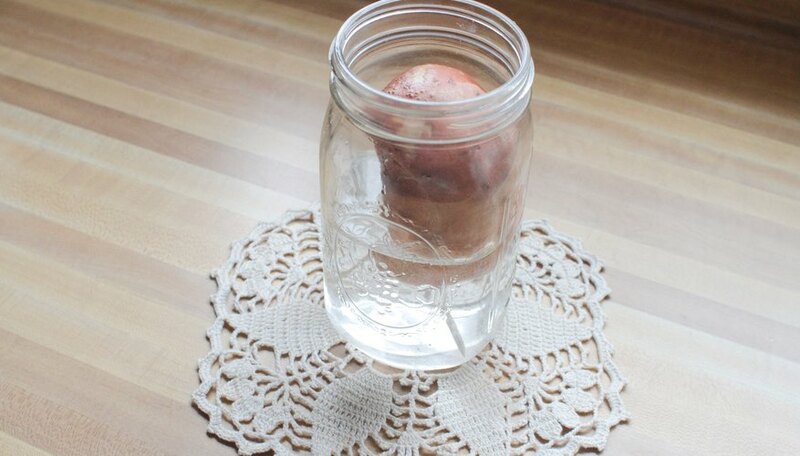 Add enough water to the jar so the bottom of the potato sits fully in the water. Place the jar in the window sill or a place where it will get lots of sunshine. Check the jar daily, adding water when needed to keep the potato bottom wet. Soon you will see sprouts forming on the bottom of the potato. These sprouts show roots beginning to emerge. In a week, you will see small leaves growing from the top. Keep the water level the same in the jar, so the sweet potato bottom stays wet. A few days after you see the first leaves, you will see vines growing. After two to three weeks, you will have several long vines with green leaves. 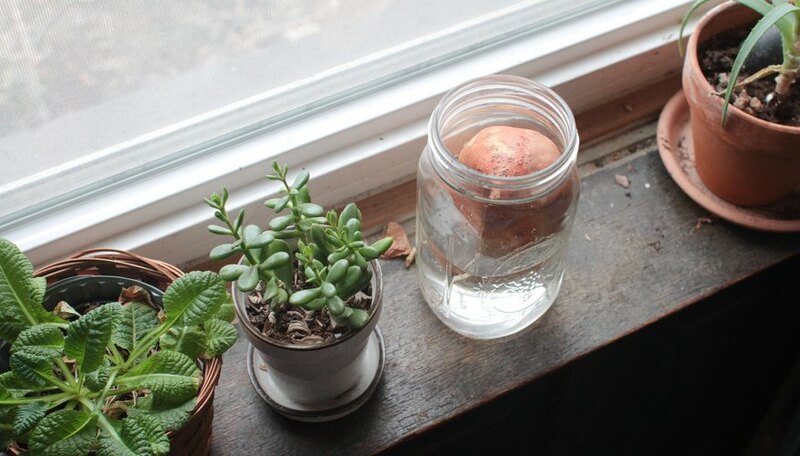 You can continue watering your potato as usual in the jar or transplant it into a pot with soil. 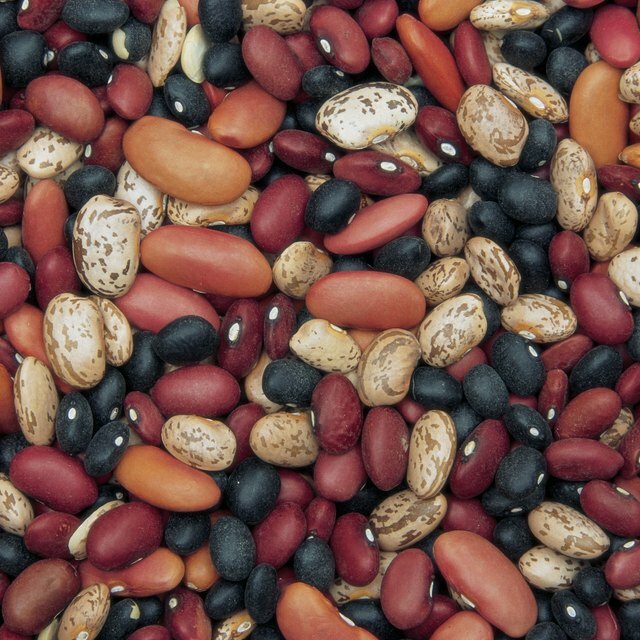 Your sweet potato will continue growing into a green, leafy houseplant. 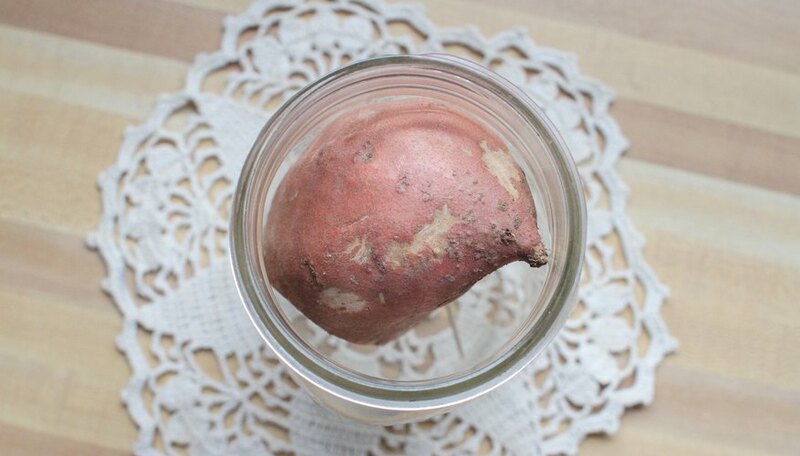 When growing the sweet potato in water, pour all of the water out once each week and refill it with fresh water, covering the bottom of the potato. Transplant your sweet or white potato by placing it into a pot large enough for you to bury the potato in soil. Cover the potato with potting soil, patting the soil around the potato. Keep the leaves away from the soil so they can continue to grow. Water the soil when it begins to get dry to the touch. Grow an avocado plant as a science project exactly the same way by submerging the bottom of the avocado pit in water using toothpicks. 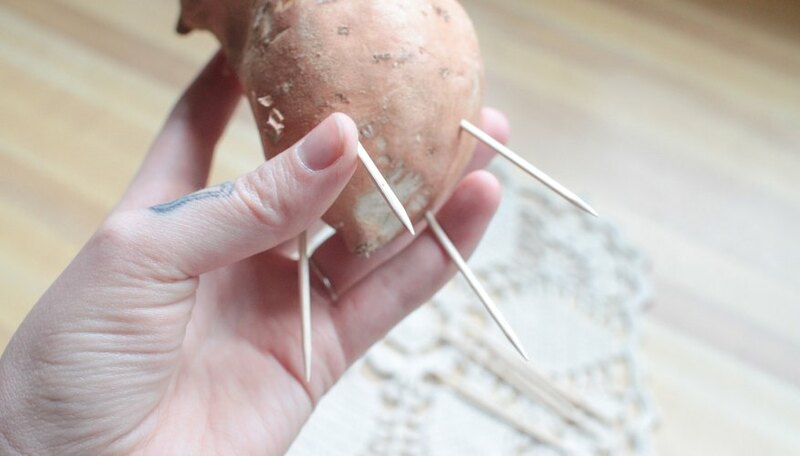 If the potato is hard, wear gloves when you're sticking the toothpicks in to avoid poking through your skin. Pendleton, Chyrene. 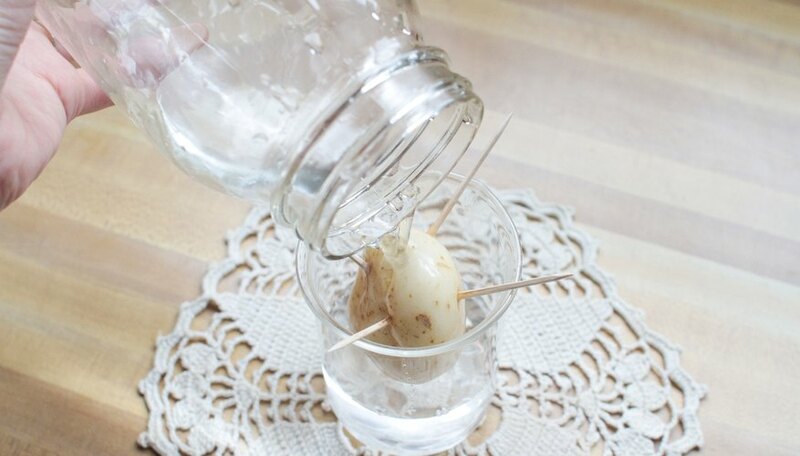 "How to Grow a Potato in Water for a Science Project." Sciencing, https://sciencing.com/grow-potato-water-science-project-6239373.html. 24 April 2018.